"Easyjet has had discussions with Wright Electric and is actively providing an airline operator's perspective on the development of this exciting technology," the airline told the BBC. The company is relying heavily on innovation in battery technology continuing to improve at its current rate. 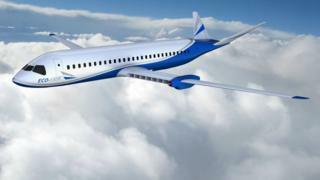 If not, the firm will not be able to build in enough energy to give the plane the range it needs. Industry experts are wary of the company's claims. Graham Warwick, technology editor of Aviation Weekly, said such technology was a "long way away". "The battery technology is not there yet," he told the BBC. "It's projected to come but it needs a significant improvement. Nobody thinks that is going to happen anytime soon. And there's all the [safety] certification - those rules are yet to be created, and that takes time." Wright Electric's competitors include aviation giant Airbus, which has been developing its electric two-seater plane E-Fan since 2014, and has stated plans to create its own short-haul electric aeroplane seating 70 to 90 passengers. Wright Electric is backed by Y Combinator, Silicon Valley's most highly-regarded start-up incubator programme. Alumni of the scheme include companies such as AirBnB, file storage company Dropbox and HR management software firm Zenefits. Wright Electric's goal, detailed in a presentation given to potential investors on Tuesday, is to make all short-haul flights electric-powered within the next 20 years, which would be about 30% of all flights made globally. "Depending on how it's designed, you can have an electric plane that's substantially less loud than a fuel plane," said Jeff Engler, Wright Electric's co-founder. "The way we've designed our plane is to have modular battery packs for quick swap using the same cargo container that's in a regular airplane," Mr Engler said. "We want it to be as fast as possible, so airlines can keep their planes in the air as long as possible and cover their costs."